Field Programmable Gate Arrays (FPGAs) are increasingly becoming the platform of choice to implement DSP algorithms. 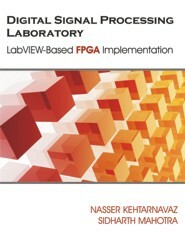 This book is designed to allow DSP students or DSP engineers to achieve FPGA implementation of DSP algorithms in a one-semester DSP laboratory course or in a short design cycle time based on the LabVIEW FPGA Module. Nasser Kehtarnavaz is Professor of Electrical Engineering and the Director of the Signal and Image Processing Research Laboratory at the University of Texas at Dallas. He has written numerous papers and seven other books pertaining to signal and image processing, and regularly teaches digital signal processing laboratory courses, for which this book is written. Sidharth Mahotra is a graduate student in the Department of Electrical Engineering at the University of Texas at Dallas conducting research in the area of image processing. Earlier, he worked as a scientist at the Indian Space Research Organization in the field of satellite image processing, CCD detector electronics and system integration.